We don’t know about you, but here at dealchecker we can’t wait for some spring sunshine. Instead of waiting around for possible (but unlikely!) temperature rises in the UK however, why not head to one of the plenty of destinations offering glorious warmth around this time of year? You don’t have to pay a hefty price for soaking up some much-needed Vitamin D either. Check out some of our most loved spring holiday spots, all with very affordable prices. Cyprus never disappoints us with its fabulous all year round sunshine, with the spring months easily hitting the low 20°Cs. Enjoy some relaxation with wonderful clear waters and sun loungers dotted all over Cyprus' most stunning beaches, with Coral Bay and Konnos Bay being some of its very best. If you prefer a bit of action on your holiday, then why not try jet skiing, water-skiing or wakeboarding? All are very popular! Malta sees temperatures in the 20°Cs in spring, so that means one thing – sunbathing! Malta's north coast offers enticing sandy beaches for you to explore and set your sun lounger up. Golden Bay (aptly named) is one of the most popular spots with a range of amenities such as restaurants and cafes. Għadira Bay is another hit, boasting 800 metres of luscious sands and standing as Malta’s longest stretch of beach. Quiet and uncrowded Ghajn Tuffieha is another fabulous find. The bay is protected by an environmental NGO, giving you a wonderful escape for swimming and chilling out. For those who like it hot, head to Cancun where the heat has really been cranked up a notch. April already boasts temperatures of 30°C, and it only gets warmer here with wonderful white-sand beaches for making the most of those rays. Cancun also brings you the well-celebrated Spring Break, so expect lots of beach parties and pumping live music at this time of year. We're heading to the Middle East for our next dose of sunshine. With highs of 32°C, this one is not for the faint-hearted! There are a wide range of stunning beachside hotels to stay in, some with views of the Arabian Gulf’s clear waters and the man-made island, Palm Jumeirah. You can try paddle boarding and surfing here, if you fancy practising water sports on your holiday. If you find that the temperature gets a bit much, fear not, for you have a heap of air-conditioned shopping malls to explore. Probably number one on any family’s dream destination list, let this holiday getaway become a reality for you! Daily temperatures are a cool 22°C in spring, giving you a moderately warm climate to enjoy. And what would a visit to Orlando be without going to the Walt Disney World Resort? We can help you find some wonderfully cheap deals so you can explore the theme parks without the price tag worry. 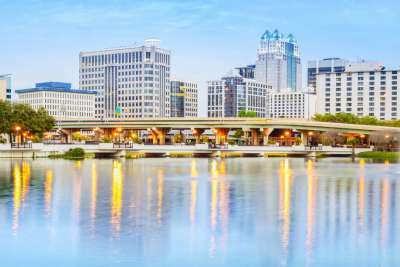 Orlando isn’t just for families though; this highly rated destination offers a wealth of exciting nightlife options and an interesting array of museums such as the Orlando Museum of Art and the Mennello Museum of American Art. One of the most intriguing cities in North Africa, we travel to Marrakech for our next stop. With high temperatures of 27°C, and a daily average of 18°C you will feel completely satisfied with your fix of warm spring weather here. Check out the main square of Marrakech, Djemaa El Fna. 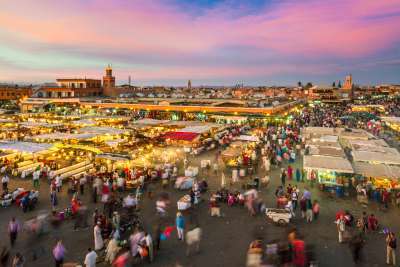 Bursting with energy at both day and night, this is a magnificent place to people watch, haggle for that must-have souvenir or taste all those Moroccan foodie delights that you’ve been craving. No, we didn’t forget about Spain, of course! 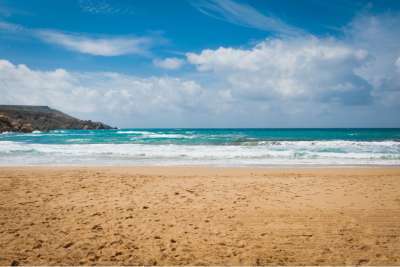 Head to Gran Canaria for a dose of lovely sunshine this spring. Temperatures average out at an attractive 19°C, meaning you can enjoy some of those fantastic beaches that this island has to offer. Las Canteras Beach is well known for its golden sands and provides you with a great chance to go surfing and snorkelling, if you want to add adventure sports to your holiday list. If you prefer long walks, spring is the best time to visit Gran Canaria, with the hills and mountains at their most colourful in April and the start of May. For those who like cooler temperatures, the Algarve might just be your best bet. With daily temperatures of 18°C in spring, but highs of up to 23°C, this is a great time of year for seeing the outdoors of this particular region. If you are a big walker, stroll along the Via Algarviana for a scenic route and a memorable day out. 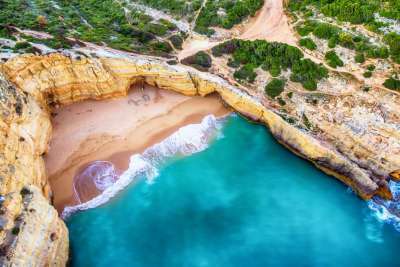 Alternatively, we all know that the Algarve is well-known for its beautiful beaches! Head to Praia de Albandeira, a tiny beach with white sands. Or Praia do Anção is a firm favourite for families with its calm seas and protected dunes. Bodrum is next on our list boasting an appealing 21°C as its average high temperature in April. The destination can get busy in summer, so escaping to Bodrum in spring is a wonderful time to visit. From its glistening marina to its gorgeous cafes and historic castle, there are lots of places waiting to be discovered, with the warm sunshine as a superb setting. We finish off our guide back in the sunny Canaries. 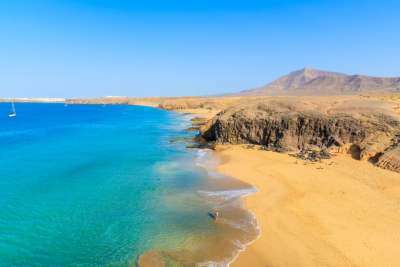 Lanzarote is a keen favourite for many beach goers who want to make the most of the weather, sand and sea. You will be spoiled for choice for what type of beach of you’d like to visit. Do you prefer stretches of fine sands with calm water? Would you like to spend the day at a secret cove or enjoy the rush of waves for surfing? Lanzarote has got all of this on offer, and much more. Discover the likes of Las Conchas, Famara and Caletón Blanco for an exotic touch to your spring holiday.